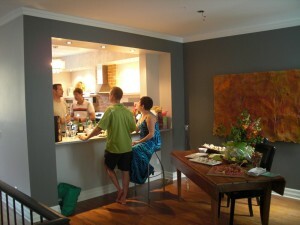 What does a kitchen renovation cost in Ottawa? After: Ed and Kate chose fantastic backlash tiles. If this is your first renovation, it’s hard to guess the cost. Glossy magazines feature $75,000 kitchens, DIY TV shows get sleep-deprived home owners to renovate for rock-bottom prices and Mike Holmes has you terrified to even breathe near a contractor. Room size is one factor, but material choices make a larger impact on the price. Choosing box-store cupboards, laminate or butcher block counters and not moving plumbing or electrical gets you a new kitchen for around $12,000. Upgrading materials and relocating appliances starts to bring up the cost of materials and labour. We never mark-up materials, even when we order or pick-up the materials for clients. If a 2×4 costs $2.15, then that’s what my client pays. No plumbing or electrical moving. New floor and backsplash tiles, Ikea Stat cupboards, Ikea Tyda handles, Ikea Numerar oak butcher block counter, lighting, paint and all materials like tile grout, etc. Time needed: 13 working days. Kitchen size: 16′ x 10′ Removing bathroom adjacent to kitchen to enlarge the kitchen. Requires capping old plumbing and moving electrical, including adding new recessed lighting. A certified electrician to be brought in. Ikea Akurum cupboards. 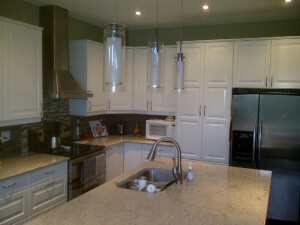 Customer supplying granite counter, cupboard handles and backsplash tiles. Time needed: 15 working days. No plumbing or electrical moving. Materials: Ikea Stat cupboards, Ikea Pragel walnut effect counter and Ikea Tyda handles (seriously, Ikea did not pay for this blog post). 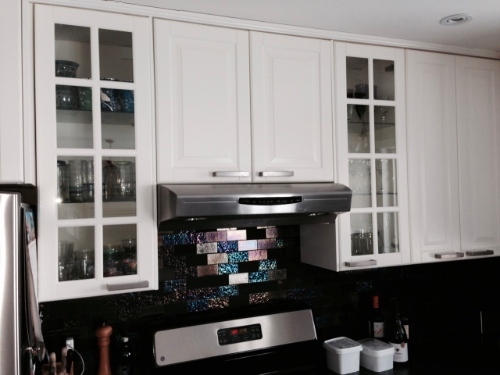 Client supplying backsplash tiles. Time needed: 5 working days.